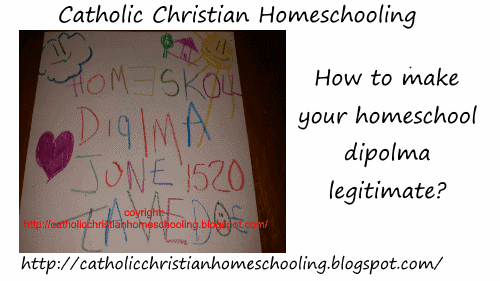 Catholic Christian Homeschooling: How to make your homeschool diploma legitimate? Despite what people may think homeschooling parents can issue and make diplomas for their children. Truthfully, a diploma written in crayon is just as valid and legitimate as one that is nicely typed up. I advise you go with the nicely typed up. If you don't want to type it up yourself you can pay a small fee to a company that will make a diploma for you. Why use a nicely typed up diploma? Well it looks professional, nicer, and generally speaking is questioned less then one written in crayon. The one written in crayon would most likely be dismissed as a joke. You don't want your child's education to be seen as a joke. If you are homeschooling during the high school years, you will want to keep records, detail records, even if you state doesn't require records. This makes transcripts easier to do at the end of the your child's high school career. Armed with good transcripts, records, and other things like test scores your child should have no issues with their post high school choices. Actually, many colleges seek out homeschoolers and many even list what they require from homeschoolers on their websites. Or you can talk to the admission department of the college you're thinking of and ask them what they would want from you. If you go the make your own diploma route, besides avoiding crayons, you will want to include certain information like: It's a high school diploma, your child's name, and wording that indicates your child completed the requirements needed for graduation. HSLDA site has more details.